North Cyprus beaches are amazing and if you are spending your holidays in this area they are something that you definitely should check out. There are a number of beaches and the best way to see them all is by rental car. Thousands of people explore the beaches of north Cyprus every year and if you want to find a beach that isn’t teaming with tourists then a hire car such as a 7 seater is a must. You can pack everything you need into the spacious boot and spend the day exploring the sands. Some of the beautiful beaches you will find in north Cyprus stretch for miles and the landscape and breath taking scenery is something that you will remember forever. The golden sandy beaches that are located in north Cyprus are some of the best you will find worldwide but in order to see them in their glory you will need a hire care. Listed below you will find some of the beaches that are a must see on your holiday to north Cyprus. Take your hire car and travel to Famagusta in North Cyprus. Here you will find Famagusta bay. This is a spectacular long golden sandy beach that stretches as far as you can see. You can spend the day here if you choose soaking up the sun and enjoying the wonderful unspoilt views. Take a picnic in your hire car and you will have the perfect day out. 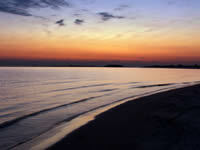 There are a number of other beaches located in this area that you can explore also. These are Palm Beach located near Varosha, Glapsides a public beach, silver beach, and Bafra public beach. All of these beaches have golden sand and cool clear waters too. The scenery that you will find is utterly amazing and a picnic on any of these wonderful beaches will be enjoyable. Of course if you don’t have a hire car you will miss out on this. The Karpas Peninsula is another great location if you are looking for private unspoilt beaches. This area is remote and in order to get here you will definitely need a hire car. When you reach the Karpas peninsula the first beach that you upon is the beach at Kaplica. This beach is excellent for sun worshipers and you can spend hours soaking up the sun. There is also a public beach just three kilometres away called Yeni Erenkoy. This beach has showers and restaurants if you need them. The Karpas Peninsula is full of history too and swimming at the Kasa Beach or Ayios Philon means that you will in fact be swimming in the ancient harbour of Karpasia. Moving along the southern coastline you will find even more amazing beaches. Most of these beaches are secluded and have no amenities so if you are looking to get away from it all for the day these beaches are perfect. 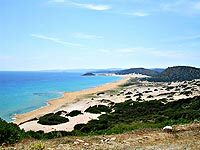 The Golden Sands beach is the most famous beach along the Karpas Peninsula and here you will find magnificent sand dunes and the famous north Cyprus breeding sea turtles. These turtles are a protected species so you cannot disturb them but it is a magical place and one that is well worth visiting. There are other beaches to be found in the vicinity of Kyrenia and the best one if you have children travelling with you is Escape beach. The waters here are shallow and you can drive your rental car right onto the beach. Horseshoe beach is another option but instead of golden sands you get pebbles so if it’s a change you are after this might be just the thing. This beach is perfect for snorkelling and the remains of the Persian palace can also be viewed. There are a number of other beaches in the Kyrenia area including Acapulco beach, Esentepe Beach, Vogue Beach, Lara Beach, and the Alagadi beach. As you can see when it comes to beaches, North Cyprus has everything you could wish for. All you have to do is get a hire car to take advantage of them all. Book your car hire now! !